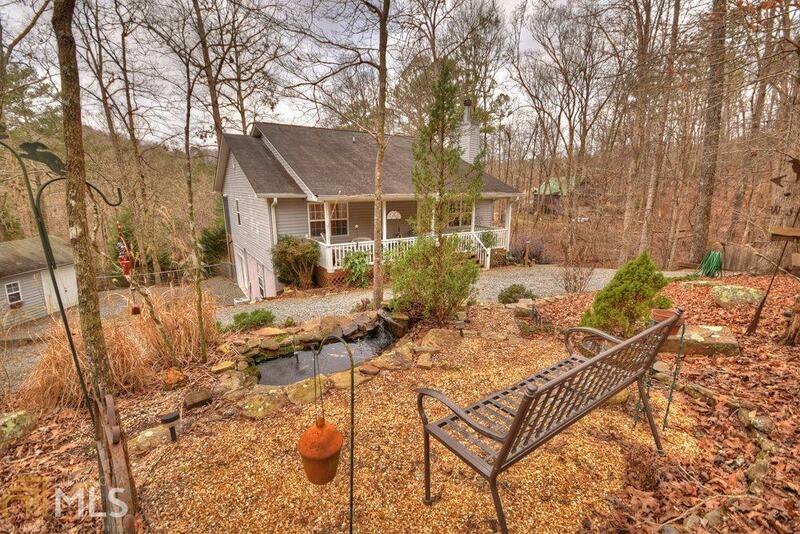 Lovely 3BR/3BA Ranch Home, located on a quiet cul-de-sac with seasonal view of the Coosawattee River. This house is beautifully landscaped with koi pond & large fenced in yard to include adjoining lot for privacy (1.25 acres) Home features popular open concept floor plan w/plentiful natural light, gas log fireplace, wood floors, 2 bedrooms on main including master suite w/walk-in tile shower. Finished basement has family room complete w/wet bar plus a guest suite. Rocking chair front porch, screened back porch & patio to enjoy the outdoors & view the abundant wildlife. 1 car garage, 12x16 "He or She Shed", circle driveway, located less than 5 miles from town, super convenient to gate. Easy walk to the river from this home. Directions: From Downtown Ellijay, Take Old Hwy 5 S Approx. 2.5 Mi To Rt On Ellington Rd. At 5-Way Stop, Continue Straight On Riverview Dr. Go 0.3 Mi To Rt On Zenith Tr. Go Approx. 0.2 Mi To Lt On Centergate Dr, Then 0.2 Mi To Rt On Cannon Ct. Continue To House On Lt.